After the eviction last night, thousands of people are swelling in front of a barricaded Zuccotti Park chanting "Open up the park!". The area is completely surrounded by police forces, however, protesters are waiting to see if a verdict from the court handling a demand against last nights eviction will allow them in again. The argument is that they can't evict the park before showing a decisive cause for it. Berlin has its own Outraged camp: a loose network of politically critical people started occupying the city's main square, Alexanderplatz, since Saturday night, following the example of north-African and Spanish revolutions. After the nightly event "aCAMPada Berlin goes aCAMParty" it was decided to camp out in order "to demonstrate against various political events, that aren't compatible with the free democratic basic order of the Federal Republic of Germany anymore", according to a local newspaper. Some of these incidences are "the manifested intention of the Merkel administration to establish a European economic government, the participation of the federal government in theNATO war against Libya and the feared military intervention in Syria. We see in all of these developments of the last days an acute danger for peace and democracy". The motivations of the outraged of Berlin were illustrated in a letter some of them sent to theglobal community last Sunday. American institutions and government have been captured by oligarchs and kleptocrats, who systematically set about stealing and looting what was once a great nation. America can once again be a great nation, but we must take it back. NOBODY will do this for us. It will not be handled back to us by bought 'representatives'. Wall Street is a huge contributor to the political machine, which in turns enables Wall Street's corporate plunder of our nation. Both the Democratic and Republican parties set the bankster agenda because of the MONEY. When we speak of 'taking the MONEY out of politics', we have no choice but to focus on the sources of the MONEY. As a critical FIRST STEP, we call on Citizens to take the lead. Bring your friends and neighbors together to non-violently protest the tyranny of kleptocrats on Sept 17, 2011 (#Sept17). We at usdayofrage.org DO NOT tolerate violence of any kind. US Day of Rage NYC, San Francisco, and Los Angeles stand is solidarity with each others' actions and endorse the planned actions of the NYC Assembly to #occupywallstreet on #Sept17. We will support and endorse the planned action of a NON-VIOLENT occupation of the financial district by the free and independent assembly of people, which is currently being planned by the NYC Assembly. We will post their website and plans as soon as they are live. The next assembly meeting is Saturday, August 27, 2011 at 5pm in Tompkins Square Park. Come down. Everyone is welcome. Massive riots have turned North London into an “absolute war zone”, with a bus, three patrol cars and numerous buildings set on fire. North London has erupted in violence tonight following the shooting dead of a 29-year old father of four by police on Thursday. Earlier tonight, a peaceful protest was held to demand answers about the circumstances of the lethal shooting. As night fell, the protests turned to violence. Another witness reports that “the whole of the police station is surrounded by… about 100 police officers in riot gear and they threw a wheelie bin into it and then started throwing bricks, street signs, anything they could get their hands on, straight at them.” Police have brought in horses, dogs and even a helicopter. The Israeli social justice movement has just gone into orbit and exploded into previously unchartered territories. According to police estimates (which tend to be conservative), 300,000 protesters took to the streets across the country in what constitutes the largest-ever protest in the country’s history. And still no coverage in the mainstream media! The stellar growth of the J14 movement, which was sparked when a young Israeli woman named Daphni Leef pitched a tent in Tel Aviv three weeks ago to protest against the unaffordable cost of housing in the country, has put immense pressure on the right-wing government of Benjamin Netanyahu. In just three weeks, the Prime Minister has seen his approval rating tumble nearly 20 percent, to a dismal 32 percent. The protests, while feeding on the widespread anger in the middle class about the unbearable cost of living, have since matured to take up a number of other progressive issues — and have now morphed into a full-blown social justice movement, contesting the free-market zealotry of Benjamin Netanyahu and the crony capitalist system that lurks behind the neoliberal edifice his government is trying to keep intact. On Wednesday, August 3rd at 8:30am a protest will be held at New South Wales Supreme Court, 184 Phillip St, Sydney Sydney, Australia. For more information see http://thejusticecampaign.org/. Brandon Neely, has been a vocal critic of both Guantanamo Bay, and the war in Iraq. And he speaks from experience, since he was both a guard at Guantanamo during the the first six months the camp was open, and served in Iraq during the US invasion. In the course of his advocacy, he has offered testimony to the Center for Human Rights in the Americas, and appeared in numerous articles and on television programs, including a BBC program that recounts how he contacted two of his former prisoners on Facebook to express remorse for what he did. You can also find him on twitter, @BrandonTXNeely. He knew David Hicks while Hicks was incarcerated at GTMO. To read WL Central's interview with Brandon Neely go here. As of July 7th, 2011, the outraged movement in Spain has already prevented almost 47 evictions, according to the Platform of People Affected by Mortgages (PAH in Spanish http://afectadosporlahipoteca.wordpress.com/), which aims to defend the "right to housing". From their website they are constantly making calls to ensure that families with financial problems avoid becoming homeless, denouncing that real estate speculation has led many families to inhumane situations. They also denounce the fact that, in Spain, around 180 evictions are executed each day, too many to be stopped. Over the past days the Spanish National Police force has coordinated to evict many of the squares that continued to be occupied by the 15M movement. The squares in Palma de Mallorca, Manacor, Santa Cruz de Tenerfe, Badajoz, Castellon, Gandia and las Palmas have been emptied forcefully and cleaned up. The last one to fall was the camp in Valencia, which was evicted early in the morning, at around 5.30 am local time and without warning. Most of the camps were small and the people staying there were coordinating the information booth left in most squares, as well as other permanent activities. This made most evictions easy and pacific. With Greece sinking in chaos, the country's MP's have voted in favor of the five-year austerity plans prescribed by the UE along with the IMF and other foreign banks. The vote, thought by some to be very hard to predict, turned out as a clear statement in favor of the harsh measures opposed by the population (a summary of the conditions can be found below). In the end PM Yorgos Papandreu achieved 155 votes in favor, 138 against and five abstentions, thus avoiding bankruptcy at a cost nobody seems to want to pay. The voting was made under such pressure that a member of the ruling party Panagiotis Kouroublis was expelled for voting negatively, reducing the party's majority to 154 seats. As the protests around Spain come to an end, the signs of weakness shown by the 15M movement over the past weeks - the frustration against the slow assemblies, the possibility of violence inside of the pacifist ideals (violence in Barcelona http://www.europeanrevolution.net/?p=539) or the lifting of the camps - have been forgotten after the massive protest carried out in over 30 cities nationwide. According to the techno ant map (here ) the protest happened in 98 cities internationally. The number of protesters is, as always, hard to know for certain. The main media source in Spain, El Pais, claims that around 200,000 people participated in the major protests, making the number probably higher. In Barcelona a whopping 100,000 people marched according to most sources. It was larger than in Madrid where 35,000 to 50,000 people participated in the event. Some say, however, that over 100,000 were present throughout the day. It is truly hard to tell. Six columns initiated the protest marching towards Congress from different neighborhoods around Madrid. ALEXANDRIA, Va. — David House, a founding member of the Bradley Manning Support Network, is among several Boston area residents who have been ordered to testify before a federal grand jury convened in Alexandria, VA to investigate WikiLeaks. House is scheduled to appear tomorrow, Wednesday morning, June 15th. In addition to supporting David House and opposing the grand jury investigation of WikiLeaks, the protests will draw attention to the ongoing pretrial confinement of PFC Bradley Manning, a U.S. Army intelligence analyst who stands accused of blowing the whistle on illegal and unjust foreign policies. “The Justice Department’s unprecedented crackdown, not only on accused whistle-blowers, but also their friends and supporters, stems from the same impulse to silence legitimate dissent that has become a hallmark of corrupt governments the world over,” said Kevin Zeese, an attorney with the Bradley Manning Support Network. "It is heartening to see that some witnesses are refusing to cooperate with this campaign to conceal the truth." Despite the obfuscation of information by major outlets in traditional media and Internet, the movement born in Europe on the past 15th of May is spreading all across the continent, each day with more intensity and popular support. The repercussions, both in economic and political scenario are still unknown, in the same way the effects of the Cablegate episode of November 2010 were difficult to apprehend in that date but step by step shows its importance to contemporary society. The revolution lead by the European youth holds all Western economical and political structures as its enemy and is the type of social movement that does not have its shelter- an essential characteristic of a revolution. Relevant information of the gatherings, protests and projects are provided uniquely by independent media, and in some occasions these are being boycotted. The website for the Real Democracy Now platform in Berlin claimed that they were attacked, and the independent media site, www.europeanrevolution.com was finally put offline illegally, after having been blocked via DNS in, at least, France and Belgium. Below is a recollection of information from past events in different countries. As the main camps in Puerta del Sol (Madrid) and Plaza Catalunya (Barcelona) prepare to pack their tents and leave on Sunday, organizers have started to spread their message to the rest of Europe. From the beginning the Internet was abuzz with proposals of a European revolution or a #globalcamp, and for that purpose thousands of blogs and independent websites have been opening, planting the roots of the protests happening now in over twenty major cities in France, Italy (full agenda and aditional information in English here) and Portugal. 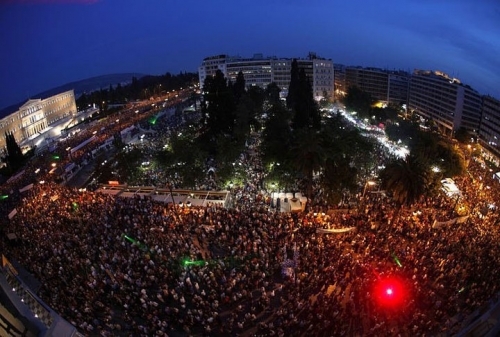 Greece has also taken the streets and an estimated 30 thousand people are protesting outside of Athen's Parliament as we can see from this live feed. Here you can find a live streaming of the General Assembly in Paris. WL Central will be updating news on Iran, with new items added at the top. All times are ET in USA. You can contact me on twitter @carwinb or by email at carwinb@hushmail.com. Don't send media when links available. Most email is not encrypted and not anonymous. I cannot guarantee anyone's safety in transmission.